Dotting the map with all the famous cities that decorate the top lists of European capitals, there is a surprising lack of mentioning Skopje. This mistake changes at a rapid clip though, for many tourists have witnessed a city so eclectic and amazingly entertaining, offering travellers and citizens alike a place where culture, tradition and modern mix into a perfect, unforgettable blend. It is all of Macedonia comprised into one, if ever there was such a thing. The city breaths in its own distinguished rhythm, and once here tourists are able to sense the flow of the culture this capital gives birth to. The veteran travellers, almost always enjoy a collective laugh on the expense of all the foreigners who never decided to choose this amazing city as a destination. What catches the eye so quickly is probably all the diversity Skopje has to offer. The urban dynamic life, the cultural heritage, tradition passed forward in a very appealing way, the mix of old and new, urbanism and nature. Everything works, more or less in tandem, to bring a singular and unique experience. A lot of places to visit, old and new; a lot of things to do, cuisine to taste, nightlife and urban day life to enjoy, cultural events to attend. Discovering Macedonia through Skopje, is an unforgettable experience. Skopje never shouts in the wind about what it has to offer. Everything is dispersed and partially secluded. You will need a city guide, or better still a desire to explore. Other cities do offer numerous vestiges of variety, wherein Skopje displays variety as its biggest pride. It is a cultural kaleidoscope run wild, what it is. Rebuild after a catastrophic earthquake in 1963 the city was shaping its face rather haphazardly, intuitively. The main project was delivered by Kenzo Tange, a world renowned Japanese architect, who made the plan for Hiroshima as well. Many decades later, in 2010 the project “Skopje 2014” was announced, with the main goal to give Skopje a monumental look and a through and through change. Near completion, it has visitors’ cameras snapping like never before and has defined the ever-changing city. Starting your daily tour, the center square is as good a place to take as any. The colossal fountain monument of Alexander the Great is a rare sight indeed, and around are the monuments of other great people who influenced the history of this country. Being so close one to another, many will argue that it is slightly kitsch, but the appearance of the square in overall context is decent by usual standards. From there you should cross the Stone Bridge, another monument of history, and head for the other square situated at the entrance of the Old Town.Lots of colossal monuments and fountains there too, and the building of the Macedonian National Theatre, the museum of Macedonian struggle and the victims of communism, the marvellous archaeological museum and many administrative buildings build in baroque style. There is also the Holocaust memorial center and two overly decorated bridges with fountains and statues. On the entrance of the Old Town you will see Daut Pasha Hamam, a building that once, during the Ottoman rule, served as a public bath. Now, a gallery space and place for recitals and cultural events it only introduces you to the spirit of what these old Ottoman buildings are nowadays used for. Culture blends together with tradition in the full symbiotic sense of the phrase. The Old Town, home to one of the largest and most preserved bazars in Europe, introduces you to Skopje’s diversity, by serving as a stout reminder of what Ottoman times looked like. You will also find mosques, public and administrative buildings of that time, that are now, as I wrote above, a breeding ground for culture and art. Also visit Kapan An, Kursumli An, the clock tower, and Suli An. The bazar still has much to offer in handicrafts too, so it will be a struggle to resist buying souvenirs. Some of the best Burek (a traditional Ottoman food) in town can be found here. 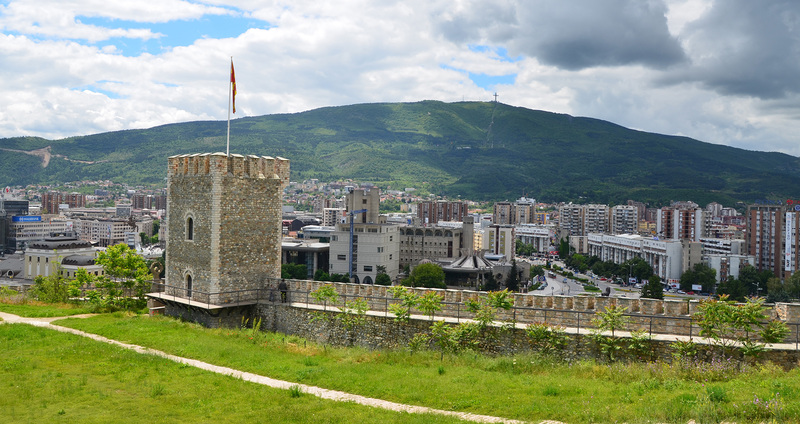 While circling this part of the city, extend your tour and climb the stairs towards Kale fortress, a medieval fortress overlooking Skopje from above. Many postcards feature Kale Fortress, especially in an evening setting and ambient light. Taking another tour near the square, you can go and visit the Macedonia gate, and from there head towards Zena Park, a tranquil place offering deep shadow and a moment for relaxation. Couple of statues and fountains to be seen here as well, and across the street you can see the parliament building. From there, head back to the main square, continuing the tour straight down Macedonia street – a place where dynamic city life can be felt at its best, with various cafes, constantly crowded, continually buzzing and creating urban noise. Here you can also find the memorial house of Mother Teresa. Straight ahead you will see the old railway station, once a pride of Skopje, today only a reminder of what the earthquake did back in 1962. The huge clock on the entrance of the building still shows the exact time when the earthquake started. This is a monument of history you ought to visit. Nowadays, if your timing is right, you can attend some of the many rich shows, recitals, and other various cultural events. Taking a D-tour and leaving culture behind for a moment, there is still much to visit in Skopje. The surroundings offer a chance to explore many interesting locations, one of which is the old Aqueduct. Having its origin still not defined, many people claim it is from Roman times, but that theory doesn’t make much sense. It was probably built during Byzantine times and it is sure that it was still used during Turkish times when it provided water for the public baths. 55 stone arches of the Aqueduct are still standing. Another attraction for outdoor enthusiasts is the Millennial Cross, located at the top of mountain Vodno, the biggest Christian cross built in the world, at the mountain overlooking Skopje day and night. The canyon Matka is fairly close to the city, offering tourists a sensory overload of another kind entirely. One of the richest canyons in the world, with cliffs shrouding it from everything else, it is a place every tourist should visit when staying in Skopje. Many activities can be done there and it can easily take an entire day out of your schedule. Day filled with gazing at impeccable nature, tasting Macedonian food in the restaurant with the amazing terrace, boat riding, and hiking towards the monastery and along the canyon. The garden variety of places of culture and tradition along with all the monuments offers a great opportunity for discovering this city via organized or self-guided tours. And my recommendation is to schedule couple of them throughout your stay. The surroundings can equally satisfy your curiosity and adventurous spirit, so there is climbing mountain Vodno, or taking the cable car to the millennial cross. Along the river Vardar, there is a pedestrian walk, and a place where citizens jog, cycle, play sports and keep themselves fit- over the years it became the icon for Skopje’s healthy way of living. Evening walks here are really relaxing and offer a nice getaway from the dynamics of the city life. The lane is 5 kilometres long, and it is almost always full during summer afternoons. At night, you can combine your walks with having a drink on the city beach. Mountain biking is very popular in Skopje too, so you can rent a bike and climb mountain Vodno, descending towards Matka, going back to the center and cycling the length of the 5 kilometres long lane along the river. The drink on the beach then would be much more enjoyable. Vodno is excellent for paragliding also, so you can take a tandem flight and see it form above. In addition, you can take a panoramic gaze at night too, by driving up to a place known as Vidikovec- the view of Skopje at night is something you ought to see. If you are here for some partying though, Skopje is the place in quite many respects. The city park is a great place for having a beer with friends, and afterwards you can continue to some of the best discos in Skopje located within the park. The other option is to go out for a drink in the city, and then continue to some of the clubs located in the center. Some prefer visiting secluded bars and cafes, some of Skopje’s most urban landmarks, and then continue to the Old Town – a place that comes alive at night and is awake till dawn, mixing a thrilling blend of locals, cafes, and bars that together create the perfect atmosphere you will always remember Skopje for. In terms of nightlife, this is as good as anything Europe most popular capitols have to offer. Not huge discos and locals, but a rather more urban blend of popular bands and distinguished bars and cafes that gives Skopje its flavor. During the day, cafes located at the Macedonia Street close to the main square, the Old Bazaar, Various municipalities like Karpos and cult places like Leninova Street are excellent for sensing the rhythm in which Skopje creates its urban life. If you are here for a longer stay, don’t forget to visit the markets, where the best Macedonian fruit and vegetables are sold. Tasty like nothing you experienced before this is probably what vegetarian heaven looks like. But don’t worry, there is even more for foodies, who will find in Skopje what many would expect from bigger more diverse cities. Multitude of restaurants, kafeanas, grill houses… Serving traditional Macedonian and Ottoman meals you will fall head over hills for. Move around the city, take taxi for it is cheap, or a bus ride in one of the distinguished red double-decker buses. Designed in a Retro style similar to the London’s Routemaster they are one of Skopje’s attractions. Skopje has a vast, frequent and efficient bus network so taking the bus is quite convenient and cheap as well. Whatever you do though, avoid traffic jams which usually occur during 4 PM. An additional blend of shopping malls, hotels, casinos and cultural events will fill your schedule no matter the length of your stay. Hotels can accommodate any taste, and hostels are rising at a rapid clip, each one better than the other. Renting apartments is also fairly cheap, so if you want to stay longer this is even better. Isolated cultural events, albeit numerous, are still the proverbial tip of the iceberg of what Skopje has to offer in term of culture and art. The Skopje Jazz festival is a world renowned event, as well as the May opera evenings where many famous artists perform. Skopje is a city that never stops breathing in the urban, modern, traditional and cultural rhythm. It is a city offering much for all types of tourists, and really Macedonia into a one cohesive, dynamic, and comprised blend. The Macedonian experience discovered through the magic of Skopje is something you will take away with you, and something you are about to talk about for year ahead.